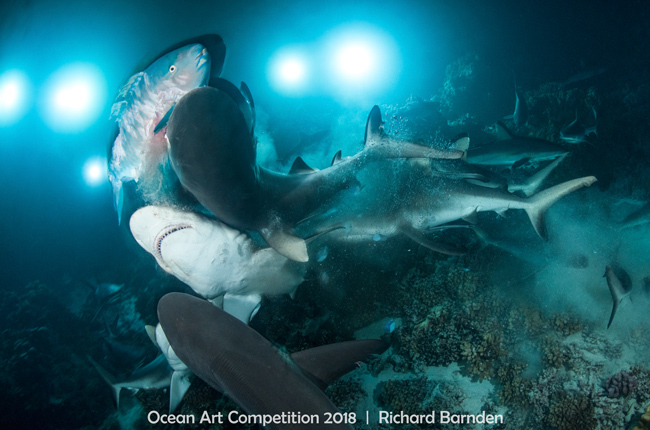 The Story: As the sun goes down on Fakarava South Pass, the estimated 700 sharks that are patrolling the mouth of the channel named the wall of sharks by day, begins to hunt at night. The gauntlet is about to begin. Life at night in this channel must be a continuous game of cat and mouse. From observing the sharks behaviour you could see that if the fish stayed still the sharks could not detect its whereabouts...stay still and survive; get scared, flee and be eaten. As we descended down into the darkness you could see hundreds of sharks already swimming very differently than in the daytime. The action was on and my heart was beating a little faster than normal. If I wanted to get a good shot I had to get close but always in the back of my mind I knew there was a very small chance of getting hurt. I was not scared of the sharks, although curious they were not interested in me at all. There were thousands of much tastier fish down here, but there could still be a case of mistaken identity during a frenzy. Out of the corner of my eye I saw a frenzy start and quickly approached. The parrotfish seen here dodged in and out of the patch coral heads looking for somewhere to hide as swam’s of sharks followed in hot pursuit. One grey reef shark had the parrotfish by its head as the other twisted underneath it to get a better grip. The parrotfish hurtled straight towards me as I snapped a few passing shots and curled up into a ball as the frenzy of sharks shot past with a few bumps here and there, leaving only but a few falling parrotfish scales behind.